The trailblazing Vic Open will have ISPS Handa as its title sponsor for the next two years. 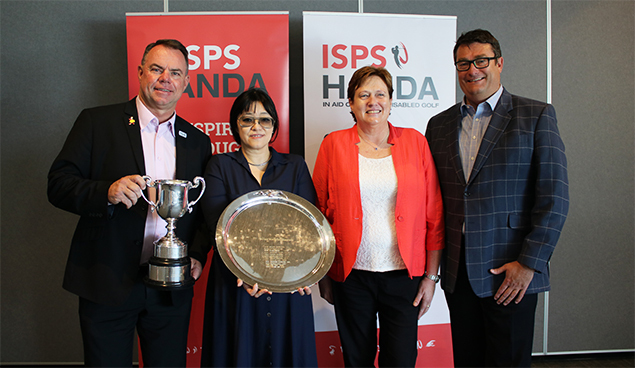 Executive director Midori Miyazaki told the tournament launch at Geelong’s GMHBA Stadium today that ISPS Handa was delighted to partner with the concurrent men’s and women’s tournament, which will again break new ground in 2019. The tournament, to be held at 13th Beach Golf Links at Barwon Heads on the Bellarine Peninsula from 7-10 February, will be jointly sanctioned by the LPGA Tour, ALPG, European Tour and PGA Tour of Australasia. “It’s wonderful that these bodies can bring such a great event to a global audience,” Miyazaki said. “The Vic Open has been extremely successful in recent years in helping people see golf in a different way – and ISPS Handa hopes, as always, to do the same thing. ISPS Handa is already a key supporter of Australasian golf as title sponsor of the Women’s Australian Open, World Super 6 Perth, World Cup of Golf and New Zealand Open, as well as the PGA Tour of Australasia itself and the recent Australian All Abilities Championship and Disabled Cup tournaments that highlighted golfers with a disability on a global platform. 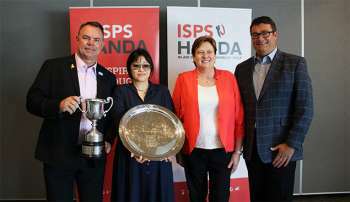 Golf Australia chief executive Stephen Pitt said the ongoing relationship with ISPS Handa through founder Dr Haruhisa Handa and Ms Miyazaki had been a boon for Australian golf at all levels. “We are again thrilled to partner with our good friends at ISPS Handa, especially at another innovative tournament such as the Vic Open,” Pitt said. The Victorian Government, another key backer of the Vic Open and its expansion to equal prize pools for men and women of $1.5million each next year, was also delighted to welcome ISPS Handa aboard. Minister for Tourism, Sport and Major Events Martin Pakula said world-class events such as the Vic Open inspire our next generation of star golfers, give an economic boost to regional Victoria and create local jobs. “Along with the recent ISPS Handa World Cup of Golf, the 2019 Presidents Cup and the Emirates Australian Open Golf in 2020 and 2022, the Vic Open strengthens Victoria’s reputation as Australia’s golfing capital,” Mr Pakula said. “We’re proud to support Australia’s only joint men’s and women’s professional golf tournament and the only tournament in the world where men and women compete for equal prizemoney on the same course at the same time.